Before the 1969 reform of the Roman calendar, Christopher was listed as a martyr who died under Decius. Nothing else is known about him. There are several legends about him including the one in which he was crossing a river when a child asked to be carried across. When Christopher put the child on his shoulders he found the child was unbelievably heavy. The child, according to the legend, was Christ carrying the weight of the whole world. This was what made Christopher patron saint of travelers and is invoked against storms, plagues, etc.. His former feast day is July 25. Saint Christopher (Greek: Ἅγιος Χριστόφορος, Ágios Christóforos) is venerated by several Christian denominations as a martyr killed in the reign of the 3rd-century Roman Emperor Decius (reigned 249—251) or alternatively under the Roman Emperor Maximinus II Dacian (reigned 308—313). There appears to be confusion due to the similarity in names "Decius" and "Dacian". However, his veneration only appears late in Christian tradition, and did not become widespread in the Western Church until the Late Middle Ages, although churches and monasteries were named after him by the 7th century. That Christopher's name, meaning "Christ-bearer", foretells his adult life may give a clue that his story lacks a precise historical origin. He may be the same figure as Saint Menas. 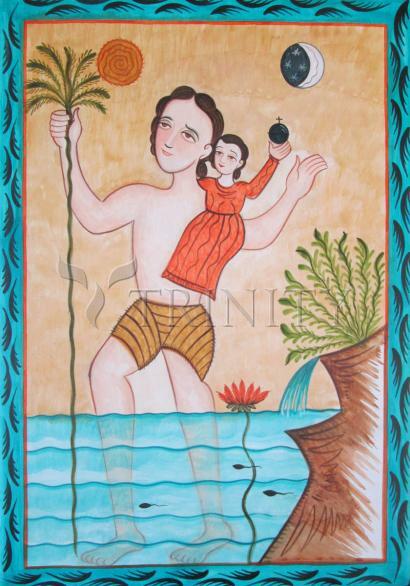 His most famous legend, which is mainly known from the West and may draw from Ancient Greek mythology, tells that he carried a child, who was unknown to him, across a river before the child revealed himself as Christ. Therefore. he is the patron saint of travelers, and small images of him are often worn around the neck, on a bracelet, carried in a pocket, or placed in vehicles by Christians.